I – Introduction: What İs Signage Station? II – How to install Signage Station? III – Signage Station user interface: How to create & Manage new account in Signage Station? IV – How to display & share content? When people say “digital signage”, they’re talking about digital displays used to inform and persuade, and it’s popping up in public spaces all over the world. Retailers and transit systems using digital signage are increasingly common, and every day more and more campuses, government institutions and corporations are finding their own ways to benefit from this increasingly affordable technology. Our digital signage software can be used for a wide range of applications…lobby reception, student lounges, cafeterias, break rooms, call centers, elevator banks, manufacturing floors, meeting rooms…virtually any public space or network. And Visix takes digital signage beyond large displays, believing that anything with a screen can be a digital sign – desktops, RSS readers, smartphones and more. Why do I need digital signage? Digital signage not only informs and engages more people through creative presentation, but also reaches them instantly and reliably – and messages can be updated or retired in real-time. It is a modern approach to communications that draws in viewers with bright, animated graphics and interactivity. These tools also improve your emergency preparedness by giving you a powerful and flexible tool to deliver security and weather alerts speedily. No matter how detailed or from what source, messages can be distributed in seconds. 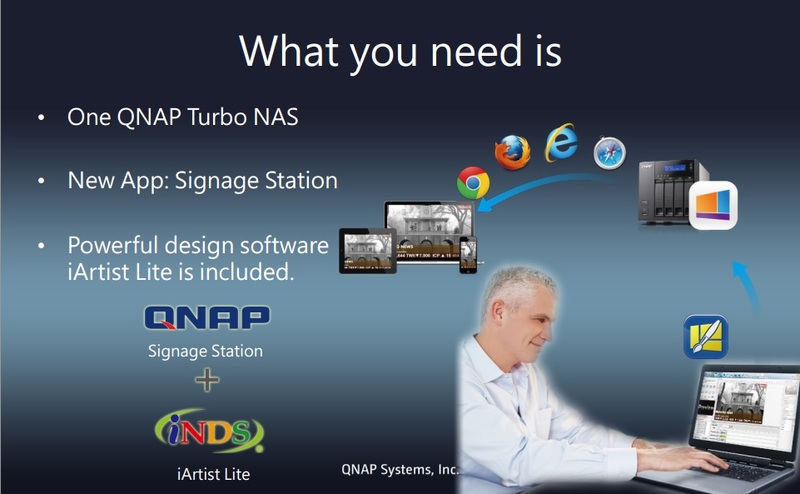 The QNAP Turbo NAS (network-attached storage) offers the new app “Signage Station” for users to edit their own multimedia content with the digital signage editing software (iArtist Lite) and display the content through a web browser. iArtist Lite is provided by iNDS technology Inc, a company that specializes in providing compact and complete digital signage total solutions that integrates robust hardware and professional digital signage software without any subscription fees. How to install Signage Station? 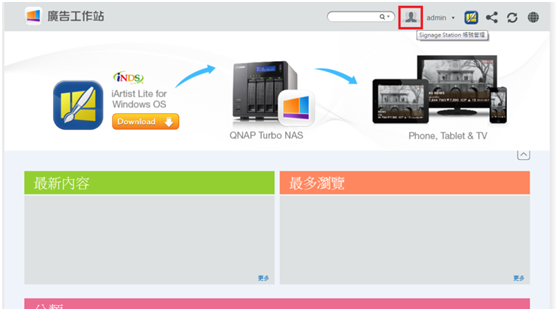 To install the Signage Station on your QNAP Turbo NAS, please log in to your user account. 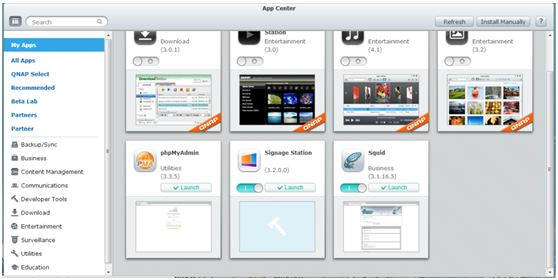 In [Main Menu] > [App Center] > [All Apps], Scroll down the page until you see Signage Station, press [+add to QTS]. Click Signage Station, you will see the Signage Station’s landing page. This means that Signage Station is installed on your QNAP turbo NAS. Signage Station provides the strong design software iArtist Lite, you can click the iArtist Lite button to download the iArtist Lite software. [Latest Release]: The list of contents which users have uploaded most recently. [Most Viewed]: A list of content most viewed by the user. [My Content List]: Every user’s content that they uploaded by themselves. [Category]: The category lists are based on different industries. These categories help users search the contents they need. To create an account for new users in Signage Station, press [Account management]. In [Account management], press [+]. Insert the new account name and password, then the account owner can use Signage Station. How to manage user account? To set the users’ authority in Signage Station, please click [account management] button . In [Account management], you can see there are three items [Upload content] [manage account] and [Delete content], you can check the check box to give users management authority. Users are allowed to upload content. Users can see the content in [manage view] button . Users can see the button and delete content. Playing content in the signage station is very easy, you just need to click the content and then it will display in your browser. You can also click [Full screen] to play content in full screen. The Signage Station is suited for any tablet, smart phone and smart TV. Share by social network: Signage Station provides various social network connections, allowing users to share content links and leave messages directly. Share by email: Users can share content links by email. 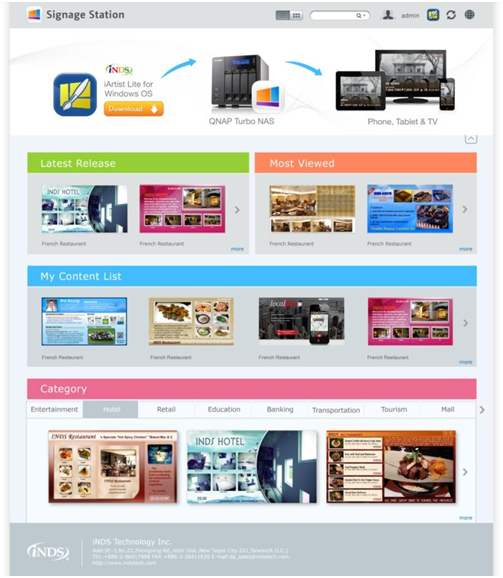 Multiple contents: User can share multiple contents at the same time. Just select the content and leave the message, then users can share the content by email. 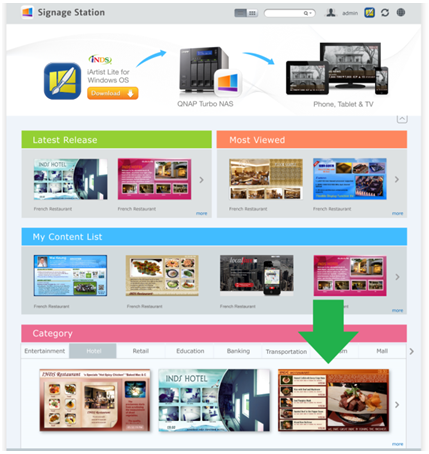 To share single content in each list, users can click [Share link] button to share the content by email or social network. Use another computer. Not sure why this is happening but some computers doesnt run this application. One of our costumer got this error. Older version of iArtist Lite Softeware may cause this problem. If it doesnt work, press reset button around 15 seconds to reset your system configration and this should work. 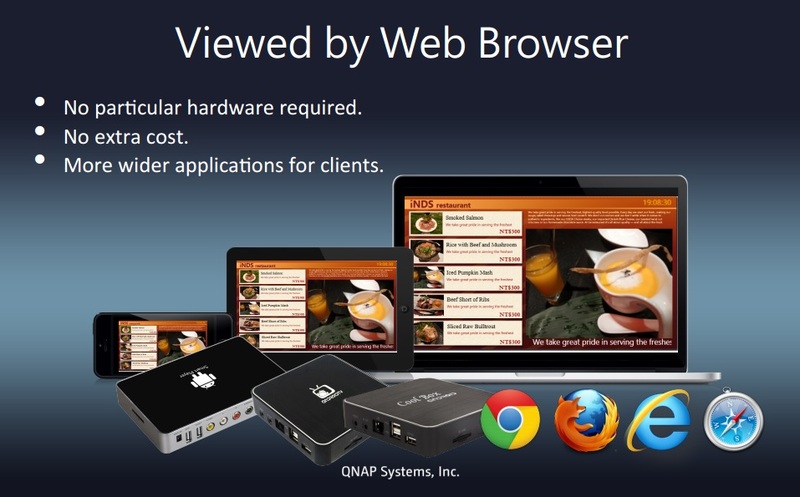 Have QNAP running QTS 4.2. Installed latest Signage Station according this page instruction. Downloaded templates but when click play, Chrome opens new page in new tab with url (http://mynasip/signagestation/1BT4h2) with 404 error (page not found). 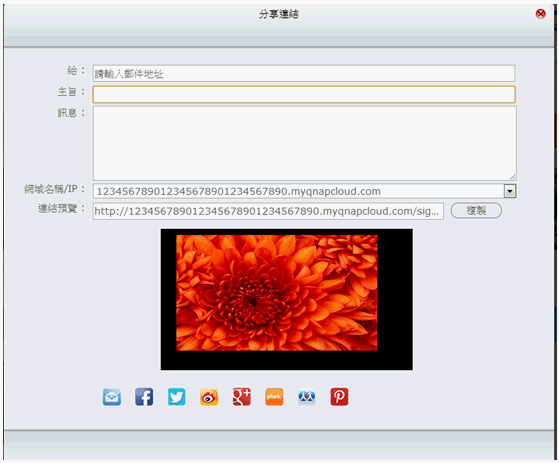 Checked QNAP using web file station, in QWeb there is signagestation folder, and in root directory there is another signatestation folder where template was downloaded and saved into /signagestation/qsourcezip and repos folders.